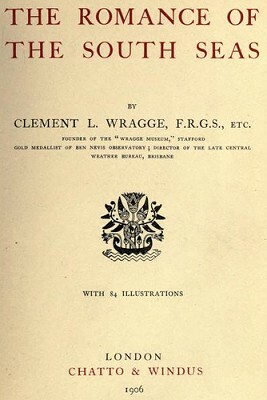 Clement L. Wragge : Raratonga, 1906. Chatto & Windus, London, 1906. This brief account reports a native of Raratonga successfully body surfing a large wave over the reef and into the lagoon, after a swim of a mile. What is that commotion by the taffrail ? Why that native woman straining her eyes shorewards, wringing her hands and sobbing so bitterly ?
" Her husband ! " says one.
" Look at him in the water ! " Sure enough, there is a man swimming for dear life. Now, the natives are great inter-island travellers ; if they can raise a pound, away they go to Raiatea or Tahiti to see friends, or just for the pleasure of the trip. And the Taviuni is laden with them. all over the place, blocking up the smoking-room to the disgust of Major Umphank, whose nose resents island odours. But what is the trouble ? The man came aboard to see off his wife, and while yet fondling and crying over her, as natives will, the anchor was up and the ship under way. No money for passage, a sudden plunge and a dash for the beach. Already, when he leaped, the steamer was a mile off.
" Will he land ? " thinks the wife ; " be seized by sharks, or dashed to pieces on the cruel coral ? " 'Tis an exciting time ; the breakers are rolling in seething fury over the reef, which the man, who is a powerful swimmer, is now approaching. The woman wails on in keenest anguish, and all feel for her.
" Give us the glasses," says the steward. " Heavens ! he is in the breakers now. Look ! he is swimming aside with all his might." A big wave bears him on the crest and he is over ; shallow water now and walking ashore. The wife, who sees it all, sighs in relief, dries her tears and combs her hair. Then to her mat, another lover comes forward to console her for the rest of the voyage, and is accepted forthwith ; so all's well that ends well. Geoff Cater (2013) : Clement L. Wragge : Raratonga, 1906.